KDF process media are high-purity, copper-zinc formulations that reduce contaminants in water using an oxidation/reduction (redox) reaction. In other words, KDF media exchange electrons with contaminants, changing them into harmless components. For example, chlorine is changed into water-soluble chloride, soluble ferrous cations are changed into insoluble ferric hydroxide, and oxygen sulfide is changed into insoluble copper sulfide. Insoluble reaction by-products are easily removed by periodic backwash. Microorganisms are controlled two ways. First, the exchange of electrons in the redox reaction creates an electrolytic field that most microorganisms can’t survive. Second, KDF process media can cause hydroxyl radicals and peroxides to form from some water molecules. The hydroxide radicals and peroxides interfere with microorganisms’ ability to function. KDF Process media improve water treatment performance by protecting, and in some cases replacing, existing filtration/purification technologies. The exceptional filtration/purification performance and versatility of KDF media make them an economical and easy-to-use water treatment technology in both new systems and retrofit applications. When used alone, KDF media can remove more than 95% of chlorine, iron, heavy metals, hydrogen sulfide, and other contaminants from water. When used in combination with Granular Activated Carbon (GAC), KDF media can significantly extend the life of carbon. Used ahead of reverse osmosis and ion exchange systems, KDF process media also safeguard expensive membranes, resins and system components. Compared to other water treatment technologies, KDF process media offer reeduced material requirements resulting in more compact and more economical systems. KDF process media also last longer thatn GAC, which means material replacement requirements are lower. Because KDF process media contain no chemical additives and are 100% recyclable, costly disposal requirements are eliminated. What’s more, KDF process media are safe for the environment. KDF 55 water treating reduces bacteria and other microorganisms by disrupting electron transport, causing cellular damage. KDF 55 process media also kills bacteria by direct electrochemical contact and by flash formation of hydroxyl radicals and hydrogen peroxide, both of which interfere with a microorganism’s ability to function. 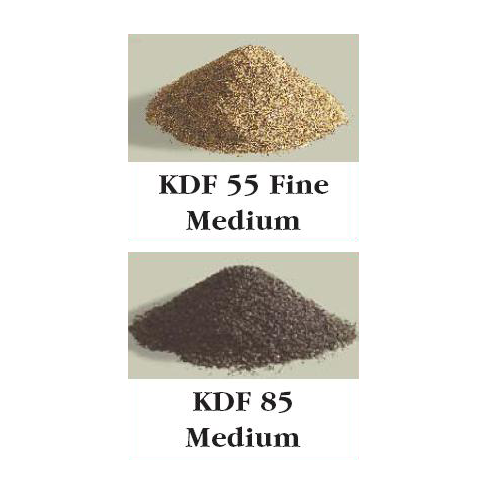 KDF 85 functions as a catalyst to change soluble ferrous cations (positively-charged ions) into insoluble ferric hydroxide, which can be removed with regular backwashing. With enough oxygen dissolved in the water, iron removal rates of 98 percent of better are common. Copper loses 1 electron (oxidation). Sulfer gains 1 electron (reduction). Copper sulfide is insoluble in water and can be backwashed off KDF 85 medium. Apparent Density: 171 lbs./cu. ft.
* Not recommended for use in water containing weak acids, such as citric and acetate. Service Flow Rate (10″ min. ): 15 gpm/sq. ft.
KDF is another fine media from Fluid Treatment, Inc.